The Department of Operations and Management Information Systems (OMIS), on Friday 2nd and Saturday 3rd November, 2018, held its Corporate Executive in Residence Programme (CERP) lecture at the UGBS Graduate Building. 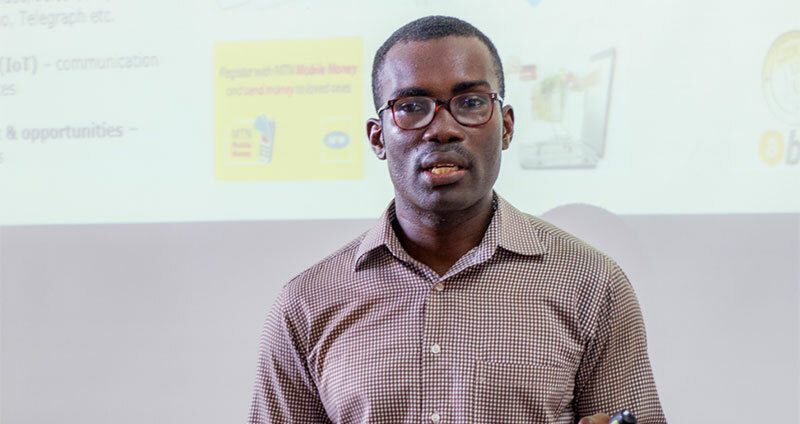 Mr. Solomon Hayford, Mobile Money Analytics Manager of MTN Ghana, was the Corporate Executive. In his opening remarks, he mentioned that data is driving the transformational agenda of businesses across the globe and businesses that are not taking advantage of the affordances of big data may perish. “In today’s business environment, if you refuse to innovate and adapt to the changes brought by technology, your business will become obsolete,” he noted. Speaking on the topic “The Role of Data in Business Transformations”, Mr. Hayford stated that, like the rest of the world, businesses in Ghana are also producing huge pile of data on daily basis, but with limited understanding of how to leverage the data to transform their businesses. With several real-world examples, he explained the need for organisations to achieve customer intimacy by analysing data to improve services. He added that the telecommunication sector, for instance, is highly competitive, and it is incumbent on players to adopt data-driven approaches to drive their transformational agenda. He further spoke of how information technologies are changing financial services, health, education, agriculture and communication services and thus, “data should be treated as a form of service because of its unlimited opportunities”. In his assessment, he reaffirmed that businesses cannot cease to innovate in this digital economy. “Your business will become extinct if you decide not to innovate”, he stated. Mr. Hayford ended by speaking on major challenges to the data revolution such as privacy of individuals. In his response to questions on privacy and integrity of data, he said, “subject to provisions in Ghana’s Data Protection Act, data processors/controllers are mandated by law to comply with relevant provisions in the Act or face the stated punitive sanctions”. He further added that the sanctity, privacy and integrity of data subjects must be protected by data processors at all times. Dr. Eric Afful-Dadzie and Dr. Emmanuel K. Awuni, representing the OMIS Department, hosted Mr. Hayford as the Corporate Executive in Residence for the first semester of the 2018-2019 academic year. Dr. Afful-Dadzie encouraged the students to acquire data science skill sets to position themselves for the analytics job market and was hopeful that the lecture would stimulate the interest of students in data, big data, and data analytics to aid in decision making in all sectors of the economy. He expressed gratitude on behalf of University of Ghana Business School to Mr. Hayford for making time to share his experiences with the students.